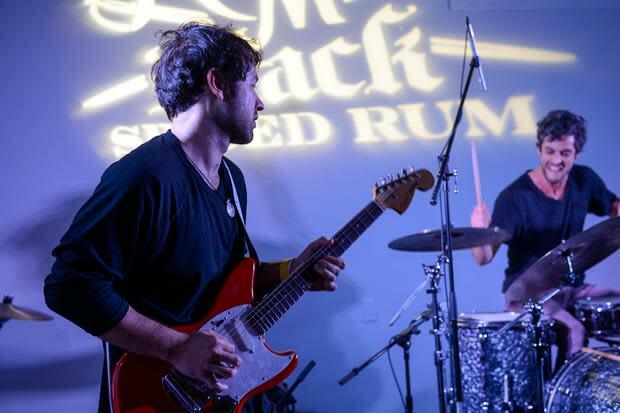 Last night's Minneapolis edition of the Step Into The Black concert series presented by Captain Morgan and FADER featured local synth-poppers Solid Gold and Portland psych darlings Unknown Mortal Orchestra. The evening began with a set from DJ Plain Ole Bill, who runs Get Cryphy, the city's most popular hip-hop night. The inside of Gallery 13 was divided into a Captain Morgan-themed room and an art space with some awesome pieces on display, so guests wandered between the two as they sipped Captain Morgan Black Spiced Rum cocktails. Gastrotruck served delicious gourmet burgers and killer mac and cheese outside the venue. We've been having a blast Stepping Into The Black with our friends across the country, and we still have more cities to hit! Jump on our mailing list to find out more.